Never miss your favorite Rejoice Radio programs. You can check here to see the weekly schedule and find out more about our programs and speakers. Crosstalk radio talk show is heard each weekday on RBN and covers the issues that affect our world, our nation, our families, and the Christian church from a perspective centered in the Word of God. Whether it’s the economy, the political scene, the continuing moral collapse of our nation, legislation that affects the family, or the state of evangelicalism, their authority is found in the unchanging standard of the Holy Scriptures. Veteran co-hosts Dr. Vic Eliason, Jim Schneider, and Ingrid Schlueter have worked as a team for over 20 years to bring solid information to the body of Christ. The weekday Thru the Bible program takes the listener through the entire Bible in just five years, threading back and forth between the Old and New Testaments. Because the program starts over again with Genesis after concluding Revelation, you can “get aboard the Bible bus” at any time. Dr. McGee began teaching Thru the Bible in 1967. After retiring from the pastorate, he set up radio headquarters in Pasadena, and the radio ministry expanded rapidly. Our teacher is Russell Kelfer (1933–2000). A layman and business man, his practical application of Bible lessons on living the Christian life are timeless and continue today. 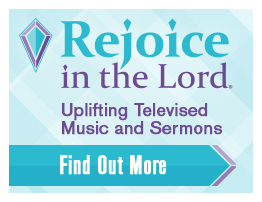 Rejoice in the Lord is a weekly program aired across the nation and around the world. The hour-long production originates from the Campus Church of Pensacola Christian College. Sound biblical messages and heartwarming hymns have become favorites with our Rejoice Radio listeners. Excerpts from such devotional masters as Charles Spurgeon, Oswald Chambers, Thomas A’Kempis, and John Newton. From “All the Kings Horses” to “World without End,” Craig Mattson provides entertaining anecdotes and explanations of everything from the meanings behind commonly used phrases to the answers to confusing capitalization. Tune in to expand your horizons! See if you can answer these challenging trivia questions designed to help get you thinking as your day starts. Ken Ham focuses particularly on providing answers to questions surrounding the book of Genesis, as it is the most-attacked book of the Bible. The Answers in Genesis ministry is dedicated to enabling Christians to defend their faith and to proclaim the gospel of Jesus Christ effectively. Meet Paul Taylor, host of the Creation Moments broadcast! Not only does Paul write and host the Creation Moments radio broadcast, he is an international speaker on creation, evolution, Genesis and apologetics. He travels across the nation and elsewhere to speak on these subjects. Paul also heads up the Mount St Helens Creation Center in the state of Washington. John Morris, President of Institute for Creation Research, answers frequently asked questions about creation in this one-minute daily Back to Genesis program. Since 1987, Adventures in Odyssey has presented exciting entertainment that brings moral and biblical principles to life. Original audio stories are brought to life by actors who make you feel like part of the experience. These fictional, character-building dramas are created by an award-winning team that uses storytelling to teach lasting truths. The show's memorable characters and situations are designed to ignite the imaginations of kids (and kids-at-heart). Rejoice Bookshelf is a 15-minute reading from classic books such as Robinson Crusoe and The Black Arrow as well as uplifting tales of great Christians such as David Livingston, William Borden, and Alexander McKay. In just 60 seconds, the Focus on the Family Minute provides a daily “nugget of truth” for building strong families. Hosted by Dr. Bill Maier, the Focus on the Family Minute features helpful advice on how to strengthen your marriage and raise your kids on the right path. Join Alexander Scourby as he reads from the pages of Scripture in Rejoice Radio’s presentation of Bible Reading. Joy in Living® is a 15-minute weekly program designed to encourage and disciple ladies in the faith. Ladies speaker Mina Oglesby and ladies Bible class teacher Beka Horton present topical lessons and in depth Bible studies. Thru the Bible—Questions and Answers is a 30-minute weekend program that shares Dr. McGee’s answers to Bible questions sent in over the years by listeners to his daily Thru the Bible program. Topics range in subject matter from deep theological issues to questions about moral and social issues Christians face in their daily walk with the Lord. The messages aired on the weekend Thru the Bible Sunday Sermon broadcasts form a collection of the most effective and fruitful sermons given by Dr. J. Vernon McGee during his 21-year pastorate at the historic Church of the Open Door, formerly located in downtown Los Angeles. Dr. Dan Rushing shares a thought and then leads the listeners in prayer about a particular subject. Many listeners are able to take part through sharing prayer requests, and they receive a blessing by developing a stronger prayer life. The Word For Life is a daily program featuring the preaching and teaching of Pastor Jon Lands. Jon is the pastor of Fellowship Baptist Church near Parkersburg, West Virginia. Our prayer is that you will be blessed and strengthened by the power of Jesus, and that you will live a life of abundance in fellowship, joy and liberty. Known for his evangelistic zeal and uncompromising commitment to the Word of God, Adrian Rogers was one of the greatest preachers, respected Bible teachers, and Christian leaders of our time. For over fifty years, he consistently presented the Good News of Jesus Christ with strong conviction, compassion, and integrity. Each weekend, come along with Patch the Pirate, Sissy Seagull, Peewee Pirate, and all the gang as they embark on life-changing, musical adventures that kids of all ages will enjoy. Fun songs are combined with good stories and strong Bible messages to create unforgettable lessons. Join Ranger Bill, Stumpy Jenkins, and Grey Wolf in Knotty Pine as they struggle against extreme odds, travel dangerous trails, and show rare courage in the face of disaster. All this in exchange for the satisfaction and pride of a job well done. Ranger Bill and his team teach Bible truths through their weekly outdoors adventures in this classic radio show from Moody Radio. Adventures from the Bookshelf is a 15-minute weekly program featuring dramatized readings of modern Christian fiction for children. From the Paul Hutchens’ Sugar Creek Gang books to titles from Patricia M. St. John, children and adults will enjoy these great stories with Christian principles. Stories about great Christians such as Martin Luther, Florence Nightingale, Charles Spurgeon, and Fanny Crosby inspire others in their daily Christian walk. Stories of Great Christians is a daily 15-minute program featuring the dramatized stories of some great leaders of the Christian Church. A weekly 15-minute program including a nature corner, music, and Bible stories. Storybook Room is hosted by “Uncle Bob” Devine. A weekly 15-minute children’s program featuring stories of animals that illustrate scripture verses. The book of Proverbs is a valuable source of wisdom from the Bible. Pause with Craig Mattson as he shares insights from Proverbs to encourage you in your daily Christian life.